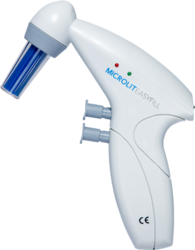 Our range of products include microlit easyfill - pipette filling device. 1. EASYFILL is an electronic pipette filling instrument that offers Single Knob Dual Dispensing Mode. For Gravity Mode : Press the knob halfway.For Blow-out Mode : Press the knob fully. 2. Comfortable grip exhibits high ease of use. 3. The instrument offers continuous pump speed adjustment. 4. EASYFILL has a Universal Silicon Adapter, with internal knurling, that can easily accommodate glass/plastic pipettes from 1 ml to 100 ml and hold them firmly during liquid handling operations. 5. A PTFE Hydrophobic In-line Membrane Filter (0.2 microns) prevents aerosol contamination and accidental liquid entry. 6. The Collet Assembly and the 0.2 microns In-line Membrane Filter, contained within it, are fully autoclavable at 121 °C and 15 psi for a duration of 10-15 minutes. 7. Ni-MH 3.6 V rechargeable batteries are used in combination with low power consumption circuit and vacuum pressure/pump, facilitating 8 hours of continuous operation. 8. The battery status is displayed by green and red LEDs. 9. A Battery Charger, compatible with both 220 V and 110 V, is provided as an inside-the-box accessory.